The scene is a high school English class. Students are reading chapter 14 of Ender’s Game, and journaling their reactions to the chapter. After finishing the chapter, one student responded aloud, “I didn’t see that coming.” This reaction was repeated during discussion and in journals, as the readers reacted to the surprising end of the story. This collective “AHA!” moment made dread of reading a 50-page chapter melt into the light of new understanding. This is only one example of how students at Exeter-Milligan High School are discovering strategies that help them discover the “AHA!” of reading. This path to discovery began with defining the reading process, experimenting with a variety of reading strategies, and concluding that learning is a lifetime process. Approximately 30% of the high school student body was surveyed. This 5-question survey asked each respondent to define the term “reading”, describe useful reading strategies, rate his or her reading ability, and vote on which genre (type of reading) each found easiest and most difficult to read. Their definition of “reading” fell into two main categories. · 25% - Recognizing familiar words, being able to sound them out clearly, and the ability to read fluently (in a smooth manner) and quickly. · 75% - Finding meaning in written words (both printed & digital), understanding the writer’s message, and learning something new. When asked to rate themselves as poor, average, good, or outstanding readers, the readers that limit reading to word recognition and fluency rated themselves as average. In the survey, average means that the readers only understand SOME of what is read. Most of the readers that define reading as a meaning-making process rated themselves as good or outstanding readers. Good refers to understanding MOST of what is read, and outstanding readers understand EVERYTHING they read. Good and Outstanding readers are more effective because they regularly use simple strategies that transform learning to read (word recognition) into reading to learn (comprehension). Based on the survey, the strategies are listed from most frequently used to those used less often. 1. Self-Monitoring – All students who use comprehension strategies recognize when they are stuck or don’t understand what they are reading. 3. Questioning – Most effective readers ask questions as they read. These questions could be about words or elements that are confusing, or related elements they wonder about. 4. Visualizing - About half of the effective readers create pictures or movies in their head to visualize what is happening in the text. 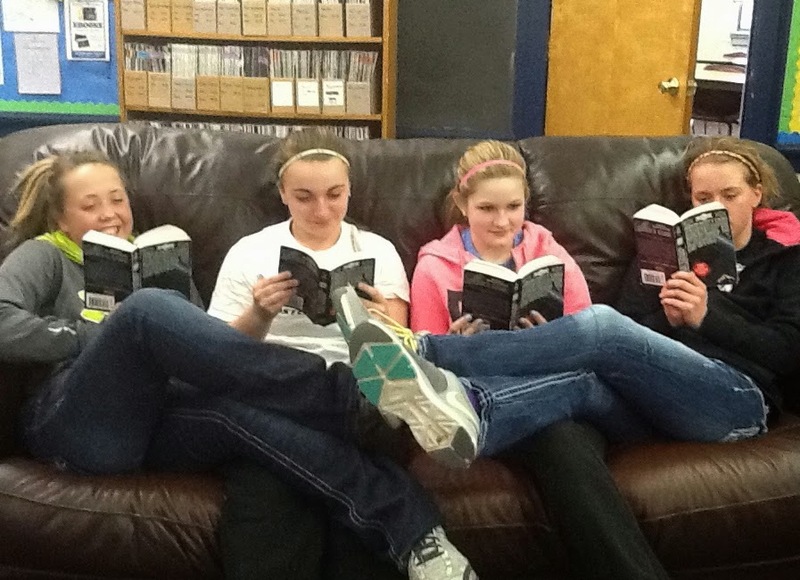 pictured reading are Katie Mounce, Kaitlyn Vavra, Janey Erdkamp and Kelsey Bigelow.